Aksjonene ble først omtalt på Dem Volke Dienen. Tyske Dem Volke Dienen har mottatt en rapport fra danske kommunister som rapporterer om grafittiaksjon i København i anledning invasjonen og okkupasjonen av Danmark 9. april, 1940. Den fant sted samtidig som invasjonen av Norge. I Danmark inngikk folketinget (det danke parlamentet) et samarbeid med den tyske okkupanten. Danske politikere ble kollobratører. 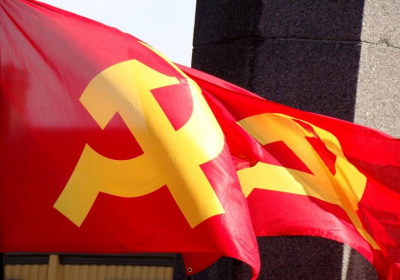 Som i Norge ble kommunistpartiet forfulgt iherdig av okkupanten og de fikk hjelp av politiet, som allerede hadde lister og informasjon over kommunistene. 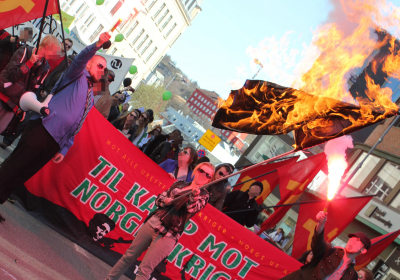 Grafittikasjonen i København rettet seg både mot tysk imperialisme og mot danske kollobratører, og den hilste gjenreisningen av Danmarks Kommunistiske Parti og initiering av væpna kamp. On the occasion of the German imperialist occupation of Denmark, the 9th of April 1940, comrades carried out a graffiti action in Copenhagen. The action condemned both German imperialism as well as the Danish collaborators, one faction of which (as represented by the monopoly company F.L. Smidth) has its headquarters in the area where the action was carried out. This company and others collaborated openly with German imperialism and the Nazi government, even participating in the Holocaust by utilizing Jewish slave labor in Estonia, profiting enormously. With this action, the revolutionaries firmly condemn this blackest period in the history of Danish and German imperialism. Thus, the action has big significance, as its political essence is proletarian-internationalist. 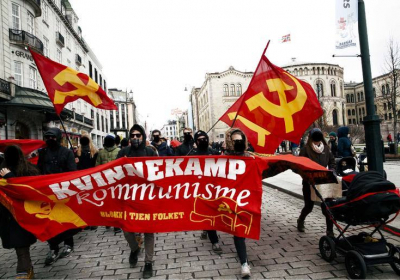 The action was carried out under the slogan: Reconstitute the Communist Party of Denmark and resume the armed struggle!, emphasizing the armed resistance struggle of the Danish people from 1940-45, carried out under the leadership of the Communist Party of Denmark, a genuine marxist-leninist Party, which is to be reconstituted. 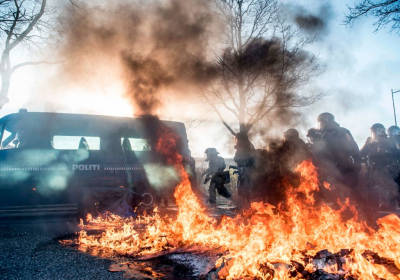 This period of class struggle shows that even in tiny Denmark, rebellion until victory is the logic of the masses, and only the leadership of the Communist Party will lead this struggle to ever greater conquests.